Since millions of years boobies use the advantages of supercavitation to survive. They developed a special way to catch fishes by diving with high velocity into water reaching up to 120 kmh and 20 m of depth. For this purpose evolution povided them with a perfectly formed beak. 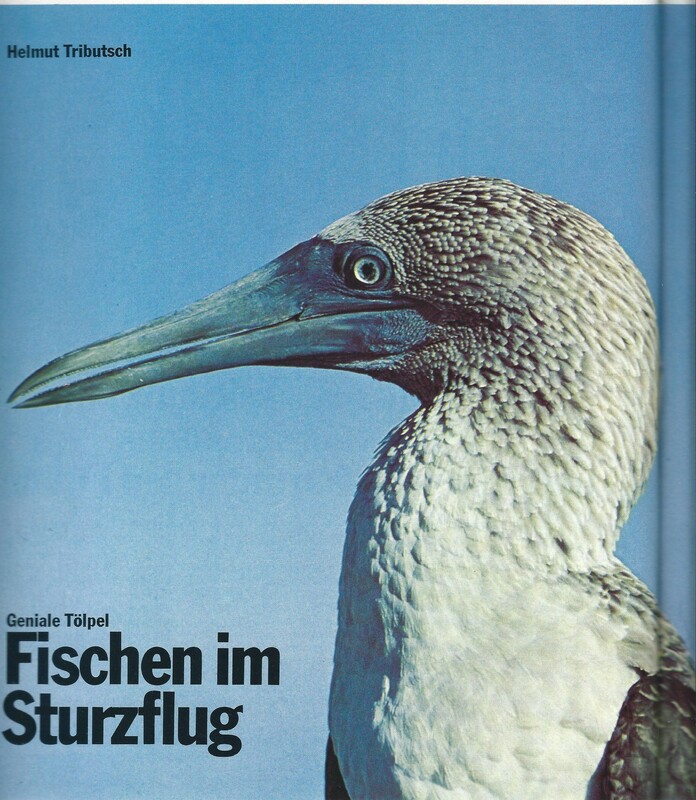 Helmut Tributsch described in great detail (Bild der Wissenschaft,1974,11, S.60 - 65) the unique technic by means of exellent photographic material. I am very grateful for his friendly permission to publish his pictures in this Website. The figur shows the streamlined head with a long and massiv beak. Remarkable is the front part of the beak with a distraction in the lower part forming a waterflow break-away edge after a straigth-lined course. Similar causes the circular formed upper part of the beak a waterflow break-away. The next figur demonstrates with serial pictures the nosedive of a booby after identifying its target. The last pictures represent the spindle-shaped body shortly before and after water-entry. The closed beak touches the water surface and accelerates the water normal to its movement until the break-away edge is reached. Now waterflow seperates from the beak. Only one third of the beak has contact to water. To calculate the formed bubble of entry and the movement of the booby the area of water contact may be treated as a cone with opening angle of 45° and cone heigth = 1/3 of length of beak. Assuming an entry velocity of 25 m/s Reichardt's laws (see coresponding chapter) result in a resistance which nearly equals the weigth of the booby. So no essential velocity reduction is to be expected. How can we explain the spreading of the tail feathers during the water entry? To understand this you have to know more concerning the generation of entry cavities. In the supplement an emperical method is described which allows the calculation of water entry cavities of bodies of revolution. It only needs the Reichardt's Laws and a spreadsheet. If you perform the calculation you receive a stretched entry channel in which air streaming around the body flows in the channel thereby spreading the tail feathers of the booby. With increasing length the initially open channel narrows down until it splits the channel in two parts: A closed bubble surrounding the bird. And an open cavity ascending to the surface and generating a vertical water jet when collapsing at the surface. The bubble surrounding the bird diminishs with increasing waterpressure until it reaches the bird and finishs its supercavitational running. Evolution needed millions of years to develop the genious method of catching fish by using supercavitation. I hope our shipbuilder dont need the same time to build ships, which move faster with smaller power by using supercavitation. All they need contains this Website.